Please refer to shopping instructions for shipping fees, abreviations, etc. All photos taken by Mary Ann Horton and cropped to fit. White and pale lemon, pale lemon center, ruffled. Ruffled dark violet blue flower & beards, slight sweet fragrance. Pale blue, deeper at base over blue-violet with pale blue lined throughout, narrow pale blue edges, beards are blue base hairs tipped gold, slight sweet fragrance. Ruffled brick red over velvety brick red, old gold beards. Light warm pink, red beards, lightly laced. Ruffled pink flower, light tangerine beards. Bronze cardinal red bloom, bright gold beards. White over white, very pale blue rims, white beards. 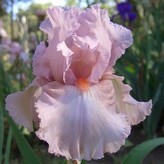 Light pink bloom, coral red beards, ruffled. Bluish pink flower, lightens toward center on falls, coral beards, darker pink hafts. 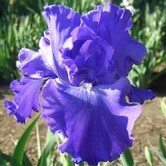 Violet blue flower, diamond dusted all over, sweet fragrance, ruffled. 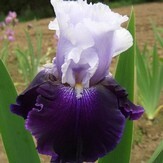 Light medium blue flower, white spot & beards, reblooms in warm winters. Caramel over silky maroon black, old gold beards. Olive cream over maroon purple, mustard beards. 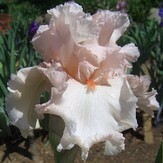 Medium violet, white blaze on falls, white beards. Dark red violet, white blaze, yellow beards tipped white. Violet blue over white stippled dark violet blue, sweet fragrance. Ruffled pink flower, light tangerine beards, slight fragrance. Red-violet over velvety dark maroon violet, ruffled, slight fragrance. Rosy orchid over velvety wine, white spray, burnt orange beards. Ruffled deep orange flower, red orange beards. Dark violet purple over velvety dark violet purple, orange beards.